I think this is close to perfect, but now, I have to admit I don't remember what "real" Hollandaise tastes like. I can assure you it is buttery-lemony-eggy delicious though, (OK, tooting my own horn, sorry) and if you're missing Hollandaise, give this a try. This is a great way to use up leftovers of the "Alfredo" sauce. What, you never have leftovers? Well, neither do I, but I was trying to make you feel better about having to make TWO entire recipes. OK, so quit whining and make the Alfredo Sauce already (with maybe less garlic if you want though, it doesn't matter, really). Heat the Alfredo sauce until simmering (add some soymilk if it's horribly thick) —pour into the blender container along with the Black Salt, pepper or hot sauce, and add the lemon juice and mustard. Blend well, adding the melted Earth Balance slowly through the hole in the lid while the machine is running. Blend until the mixture is completely mixed. Taste and adjust seasonings (usually more lemon or mustard, though if it's too strong, add some more soymilk). Pour into saucepan on stove and stir with wire whisk until heated thru. *This salt has a slightly sulphuric or "eggy" taste. It is an important ingredient for the traditional flavor in the sauce. Most Indian/Asian markets sell it, or you can get it online. It's a staple in our scrambled tofu as well! Good stuff! **Disclaimer** OK, I have only made this three times. It thickened for me just fine each time, but as with all recipes, I eyeballed the ingredients the first time, I admit. If it DOESN'T THICKEN satisfactorily for you, add 2 teaspoons cornstarch to a little soymilk and mix in to sauce, stir with wire whisk over heat until it thickens. For the above, I lightly steamed some spinach, put it on toasted English Muffins with some of my favorite tofu scramble (any recipe you like). Cover with Hollandaise and serve. Pure genius! If I can get a hold of the salt I'll have to try it out. I love your blog and I wish you would adopt me. Your food always looks perfect and delicious. wow! this is one recipe i MUST try. 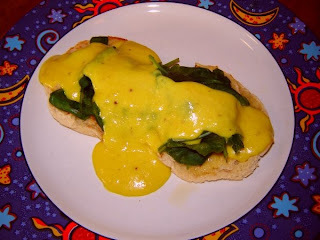 i was a egg's benedict fiend when i wasn't a vegan and miss the hollandaise sauce sooo much. Yum! I can't wait to give this recipe a try. Thanks for posting it!! i dont think i ever had Hollandaise sauce before. This recipe is the answer to my prayers! Well, that's a bit dramatic, but I'm REALLY excited to try it out, since I've been feening for eggs florentine since going vegan. And now I have another reason to check out the Indian grocery down the street!